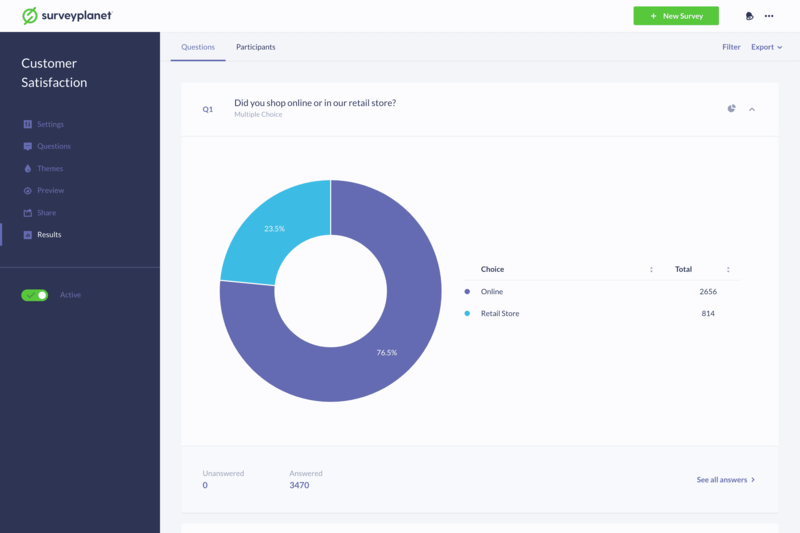 When you click on the survey Results icon , you’ll be taken to the Survey Results Summary page where you’ll see a list of all the questions in your survey along with a summary of all the answers for each question. At the bottom of each summary, you’ll see the total number of times the question was Answered and Unanswered. To get more detailed information about each question, click Question Details. Click the Chart icon at the upper right corner of the question. Select the type of chart you would like to see. The chart in the middle will change to show your selection. Multiple choice questions show the number of participants that selected each choice. The percentages are shown in the Pie chart view. Essay questions show the five most recent responses and the date they were submitted. To see all the responses, click Questions Details. Rating questions show the number of participants that selected each choice. The Ratings column shows the Choices numeric value times the Totals. The percentages are shown in the Pie chart view. At the bottom of the summary the current Average Rating is displayed. Scale questions show the Lowest answer, the Highest answer and the Average of all answers. Form questions show the five most recent responses for each input. The form labels are in the left column and the last submitted dates are at the top in the Latest Responses row. Scoring questions show the number of participants that selected each choice and the choices average score. The percentages are shown in the Pie chart view. Range questions show the Lowest and Highest answers, the Average Low answer and the Average High answer. Date/Time questions show the Earliest date and/or time, the Latest date and/or time and the Average date and/or time. Image questions work the same as multiple choice questions. You will see how many times each image was chosen. Hover over each Image icon to see the image. The percentages are shown in the Pie chart view.